How does the pay and commission structure work on Tousled? Can I set my own rates on Tousled? Yes – Each professional has their own price sheet and rates, which is set by the individual stylist/salon owner. If a client requests a professional, then the platform honors the professional’s rates (this feature is still under construction). Tousled works on a sliding commission of 15-30%. Commission rates are a function of the professional’s relationship with a client; the more a client books a professional, the lower the Tousled commission. The price listed on a job is the amount paid out to professionals – you are guaranteed this price on the job; see example above. How do professionals get paid? Professionals are paid out online, though the Tousled app. Payouts are issued daily through direct deposit; professionals are paid two days after successful completion of a job. Professionals are paid out by service; you’ll receive one email letting you know that a payout has been issued for each successful service rendered. Tousled uses the same payment platform as Lyft & Airbnb – Stripe. You will need to connect your bank account through Stripe and link it Tousled. Step-by-step instructions, including a video, can be found in Tousled professional account under Settings -> Payouts. A more comprehensive Payout FAQ is also listed there. When do professionals get paid? Payouts are issued daily through direct deposit; professionals are paid two days after successful completion of a job. Professionals are paid out by service; you’ll receive one email letting you know that a payout has been issued for each successful service rendered. What if a client wants to add services? What happens if a client is unhappy, or in the event of a dispute? Disputes are handled on a case-by-case basis. We allow professionals to set their salon refund policy such that clients are aware of the guarantee offered by your salon. Your salon guarantee is shared with clients upon booking services with you. Clients are given 2 days to file a dispute and inform Tousled of a sub par experience. Generally speaking, Tousled honors the salon guarantee as described by a professional; if no guarantee is provided by the professional, then Tousled will determine the best recourse dependent on the impact of failure. What happens if a client cancels a booking last minute? Clients can cancel up-to 24 hours in advance without a penalty. If a client cancels within the 24 hour of their service taking place, then professionals are paid in full. Professionals are rewarded for their commitment and reliability to clients. If a client cancels within 24 hours of a booking, please be sure to add these details when submitting a follow-up form to ensure a payout. What happens if the professional cancels an appointment? If cancelling within 4 days of the service, professionals are charged 100% of the appointment. Last minute cancellations from professionals hurt the entire community. This fee goes toward finding a replacement professional, or offering the client a gift certificate to try us again. The policy is not about taking money from professionals, rather providing clients with a great experience. Professionals who cancel at least 4 days in advance will not incur a cancellation fee. How do corporate bookings work? Tousled works with several property management companies to book corporate/event based services for employees and residents. For corporate services, you can expect a MINIMUM of 4 services – we stack up bookings such that professionals have a full day of services. Corporate bookings will be tagged as corporate services so that you know that there is a 4 service minimum. Each individual employee will have their own booking where you can view the date, time & client details; there is also a master booking that indicates the schedule and total amount that you’ll earn for the corporate day. Unlike on-demand bookings, professionals need only submit 1 follow-up form for corporate events – this follow-up form needs to be submitted to the master booking. This indicates your record of service for the whole day. How do I communicate with clients? All communication with clients is done through the Tousled App. Messaging is done through a Tousled booking, which matches a professionals and clients together. You can message clients directly from a booking where you’ve been matched for a booking. If you’d like to message previous clients, simply open the completed booking and message the client – you can always message your previous clients. Can I share my phone number, personal email, IG or website with clients? No. Tousled strictly prohibits professionals from sharing personal contact information with clients. You may not share your personal email, phone number, Instagram or website with clients. Doing so will result automatic deactivation of your Tousled profile, and removal from the platform. You will also be removed from all future jobs where you are matched. How will I be notified of new jobs, upcoming bookings, client requests, etc? All communication and notifications through Tousled is done via the Tousled app, email or SMS. Almost all communication is done through email; email provides an easily searchable log of information. There is no call center or receptionist available to answer questions or provide information to professionals. We are technology platform, reducing the expensive overhead of the salon and paying it forward to the professional. Professionals who are successful on our platform need to feel comfortable running their business through their laptop/phone/mobile device. What types of notifications will I receive? Does Tousled have a phone number I can call? No – there is no call center or receptionist available to answer questions or provide information to professionals. The fastest way to receive a response from us is through email; if you have questions, please email: team@tousled.me. We are technology platform, reducing the expensive overhead of the salon and paying it forward to the professional. Professionals who are successful on our platform need to feel comfortable running their business through their laptop/phone/mobile device. Can I share my phone number with clients? No. Tousled strictly prohibits professionals from sharing personal contact information with clients. Doing so will result in being removed from the platform, and no longer invited to apply for jobs. How can clients re-book me? Tousled professionals are assigned a handle; much like an Instagram handle. Your handle will likely be your first name and the first letter of your last name. Your Tousled handle lets clients request you through the platform. 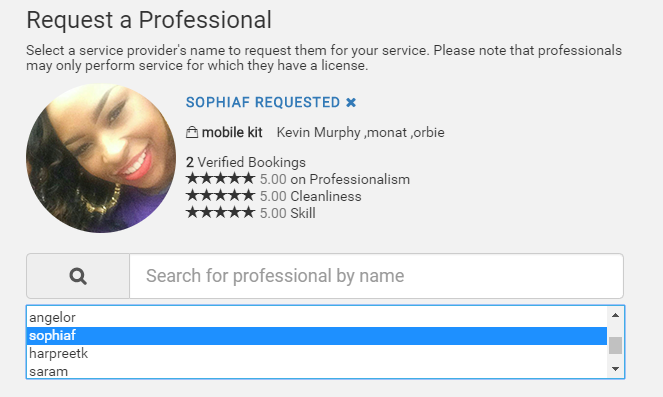 When booking services, clients can request a specific professional by entering their handle (see screenshots below). If a client requests you, then you will be notified via email and SMS about the request. Professionals have 2 days to accept/decline the request, otherwise it is automatically declined. How do I set up an audition to meet with the team, and showcase my skills? We invite our professionals to setup an audition by filling out this form to Audition with Tousled. What does the Audition entail? We’d likely have you do a basic service – like a blowout – with our matchmaking team. Please be advised that a quality service is only one part of the audition; we are looking for your ability to: arrive/leave on time, communicate effectively, arrive prepared, maintain cleanliness and provide a professional experience. How do I add photos to my professional portfolio? Photos are fantastic way to demonstrate to clients your versatility and ability as an artist. We recommend professionals have 30-50 photos as part of their portfolio. To add photos to your portfolio, please email photos to team@tousled.me. Photos will be edited, curated and uploaded by our content curator; photos will be uploaded to portfolios within 1 week of submission. You will be notified via email once photos have been uploaded. How do you determine who is a celebrity/red carpet Stylist? If I were to take appointments downtown Seattle, am I always responsible for parking? Does parking ever get validated for the stylist? Yes, you are responsible parking. Tousled connects you to clients who have paid for services in your area. We use geolocation to discern which jobs are in your service area such that you are only notified about jobs relevant to you – be sure to have your service radius appropriately set in the your portfolio.